Register Log In ECN Forum Forums General Discussion Area What's the hokiest electrical stuff you've seen? I was in Baja Mexico at a high dollar tourist trap. I happened to look over the block wall at the pool equipment. They had weathered THHN run through the bottom knockouts of the panel without even a bushing and were splayed across the ground to each motor. NO GROUNDS!! In La Paz on a busy commercial street near the waterfront a store had a receptacle screwed to the outside front wall about 4' high. No box, open conductors. Perfect kid killer!! I saw lots of water hose used as conduit too. I'm sure I can think of something hokier but these are a good start. Did not get to take a picture, but in Nassau, Bahamas I saw several meter cans serving single family houses that were made out of plywood. Not painted, not weather tight, just plywood with a meter base screwed inside, and a plywood cover with a hole cut in it for the meter to stick thru. A large pop bottle, with the top cut off, upside-down on a service mast was pretty good. My favorites were on TV shows from the 70's or early 80's. "Any Woman Can" and "You Can Do It" were both awesome. One of them built a desk with two receptacles and showed how to make an extension cord with two male ends to energize them. They even warned that you need to be careful which end you unplug first. Another good episode showed how to install a dishwasher and drill a hole in the counter-top to run the cord up to the counter plug. It isn't just that the actors didn't know what they were doing. There had to be other people in the studio with them. Off topic on electrical, but still with the TV shows, you must be careful when you cut a peep-hole in a door that the bar in the middle of the screen door does not cover the hole. Oh well, as she said "Anyone bad would open the screen door and you would be see them". The one that sticks out in my mind most is from a service call about 20-years ago where I found a piece of RG6 coax cable feeding a duplex receptacle in a finished wall of the basement of a rental home. I do have to give the person who did it credit for creativity though, because I would have never came up that idea in a million years. My uncle bought an old house and barn and called me to rewire the barn. " Oh, I think the service drop across the driveway that feeds it needs replacing too" No kidding. The "service drop" was a piece of POTS wire, red and green for hot, black and yellow for grounded. Interior of the barn wired the same way. No boxes, just 2 wire receptacles screwed to the studs by the yoke. And not 1 thing had caught fire. Amazing. 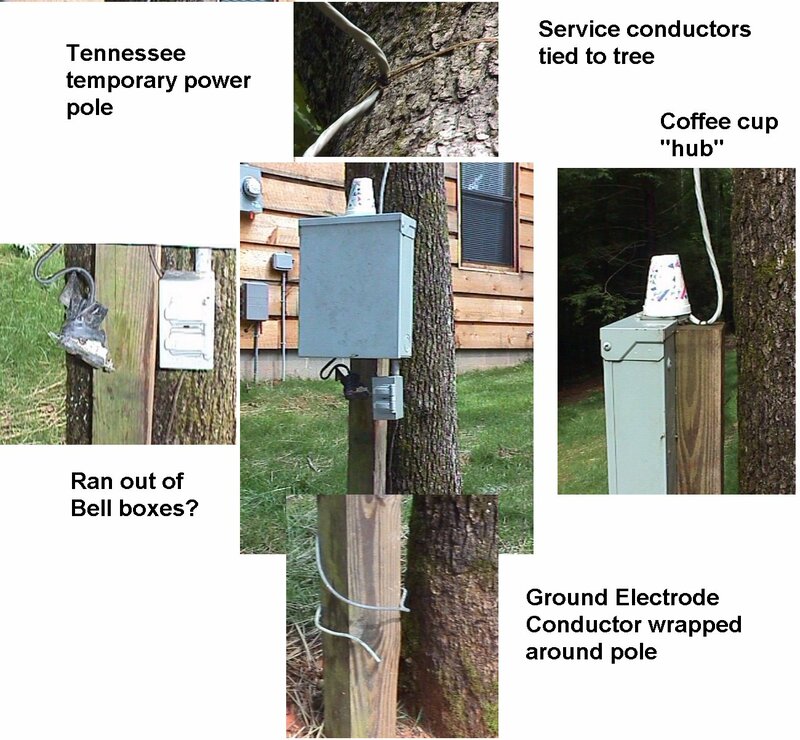 I found this temp power pole in Tennessee. It was hot. The service cable was 10-3 Romex. This was tapped off of the house next door. I am guessing they don't have inspectors once you get out of town. Last edited by gfretwell; 12/02/10 03:03 PM. Recycled from a temp job site? I am surprised they even had a GEC wire. They were building a series of "cabins". Each one supplied power to the next one as they moved along. I am guessing the power pole was only inspected on the first house. Joe T., where are you??? Greg: I can't stop laughing! !